Paros Rooms Dora are located in Parikia, just above a small beach at a tranquil area, only 1km from the port of Paros and the town center. Paros Rooms Dora offer a total of 7 rooms to let in discount prices: double, triple rooms & studios with view to the sea or the garden, WiFi, air-conditioning and TV. The nearest beach is just 50m. below the rooms, while the bigger Souvlia beach is at 850m. The central seafront road of Parikia is at 350m. accessed via a small, seaside footpath or by car. 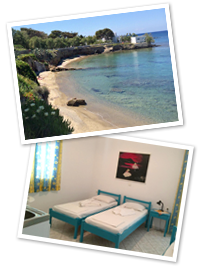 Rooms Dora is an ideal place to stay next to the beach and the town for your holidays in Paros, Greece.